It wouldn’t take anyone long to discover that I am a huge Paul Tripp fan. The following came from his recent blog. (www.paultrippministries.com). 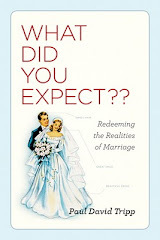 Paul asks us to look at ourselves and our marriage to determine whether or not we are building a relationship of trust. 1) Is there more unity, understanding, and love in your marriage now than there has ever been? 2) Do you both do what you promise in the time that you have promised? 3) Are you attentive to what your spouse sees as important? 4) Do you make excuses for failures to do what you’ve promised, or are you ready to confess? 5) Do you listen well to your spouse and act on what you’ve heard? 6) Do you follow through with mutually agreed-upon plans? 7) Do you work together on planning and scheduling priorities, or do you demand that the other do it your way? 8) Do you share with your spouse your thoughts, desires, hopes, dreams, and concerns, or is it easier for you to be quiet or to share with someone else? 9) Is there any evidence that you’ve withdrawn from the other in protective distance? 10) Would your spouse say that you’re good for your word and faithful to your promises? 11) Do you carry wrongs around with you, or do you trust one another to confront and confess? 12) Do you ever wonder what the other is doing when not with you? 13) Are you conscious of editing your words and withholding your feelings because you can’t trust your spouse to deal with them properly? 14) Is your marriage partner the best friend in your life or has your dream of this kind of companionship evaporated? 15) Is your sexual relationship mutually satisfying, or is it hard for you to give yourself physically to your spouse? 16) Do you say things to other people about your spouse that you’ve not communicated to him or her? 17) Do you look forward to sharing times together, and when you have these times are they peaceful and enjoyable? 18) Are there problems between you that remain unsolved because you don’t have the bond of trust necessary to work together on a solution? 19) Are you comfortable with the vulnerability that a good marriage involves? 20) Do you ever wonder if you made a mistake in marrying the person who is your spouse? 21) Do you ever fear that you’re being manipulated or taken advantage of in any way? 22) Do you ever wonder if your spouse cares for him- or herself more than for you? Is trust solid in your marriage? As you commit yourself to build a sturdy bond of trust, remember you don’t do that work alone or in your own strength. The One, who defines what trust is and does, is with you and offers you every grace you need to build relationships that picture his grace and point to his glory.